MANAGUA, Jun 23 2016 (IPS) - The seventh consecutive nomination of Daniel Ortega as the governing party’s candidate to the presidency in Nicaragua, and the withdrawal from the race of a large part of the opposition, alleging lack of guarantees for genuine elections, has brought about the country’s worst political crisis since the end of the civil war in 1990. President Ortega, a 72-year-old former guerrilla fighter, has been the elected head of this Central American since 2007, and is seeking reelection in the general elections scheduled for November 6. If he wins his term of office will be extended to 2021, by which time he will have served a record breaking 19 years, longer even than that of former dictator Anastasio Somoza García whoruled the country for over 16 years. 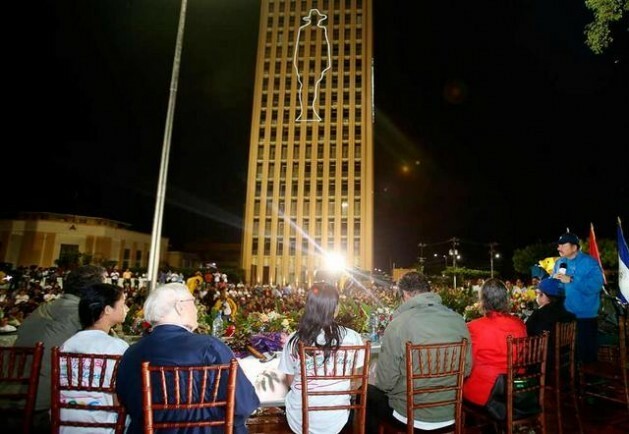 He is standing again this year in spite of already having served two consecutive terms as president, thanks to a ruling by the Sandinista National Liberation Front (FSLN)-controlled Supreme Court (CSJ). The CSJ determined in 2011 that an article in the constitution banning indefinite reelection was a violation of Ortega’s right to be a candidate. Thus the highest court in the land struck down the constitutional ban against immediate reelection of serving presidents who have served out their term of office. Ortega’s electoral hopes were further boosted on June 15, when the opposition National Coalition for Democracy (CND) was elbowed out of the race: their most promising leader, Luis Callejas, was dropped as a presidential candidate. Earlier the Supreme Electoral Council (CSE) cancelled the legal status of the leadership of the Independent Liberation Party (PLI), the largest member of the Coalition, and handed over PLI representation instead to a political faction supportive of the FSLN. In the view of the opposition and other domestic movements, these measures have undermined the country’s democratic institutions and cast a shadow of doubt over the validity of the elections themselves. Social scientist Nicolás López Maltez, a member of Nicaragua’s Academy of Geography and History, said that the way Ortega has pursued his presidential aspirations is unparalleled in Central America in the past 150 years. “He has been a candidate in seven consecutive elections since 1984. He lost in 1990, 1996 and 2001; then he won the elections in 2006, 2011 and is now an official candidate for 2016,” López Maltez told IPS. Ortega first came to power in 1979 when FSLN guerrillas ousted the last member of the Somoza dynasty of dictators who ruled the country with an iron fist for 43 years. He was the coordinator of the Junta of National Reconstruction, the provisional government (1979-1984) installed by the Sandinista rebels following their victory against Anastasio Somoza Junior. Ortega stood for president for the first time in 1984 in the first elections called by the Sandinistas and was elected for the five-year term 1985-1990. He lost the 1990 elections which marked the climax of a civil war in which armed opposition to the Sandinista revolution received political and military pressure from the United States. According to López Maltez and other analysts, Ortega has taken control of all government branches, and is therefore practically assured of victory at the ballot boxes in November. If this happens, then by 2018 Ortega will become the longest serving president of Nicaragua, outlasting the terms in office of liberal former general José Santos Zelaya (1893-1909) and Anastasio Somoza García (1937-1947 and 1950-1956) who each served for 16 years and a few months. The Somoza dynasty wielded absolute power in Nicaragua from 1937 to 1979. Three members of two generations of this family – or their puppet allies – perpetuated their oppressive and corrupt dictatorship for 43 years. Pollsters agree that President Ortega enjoys wide social support and the confidence of by groups such as private business and the police and military corps. In May, M&R Consultores published survey results indicating that 77.6 percent of respondents backed Ortega, and 63.7 percent of voters said they would cast their ballots for his socialist FSLN party. “Over the last 15 years several Latin American presidents have overturned the myth, previously regarded as incontrovertible by political scientists, that the region’s presidents enjoy high approval levels when they enter office, but high disapproval levels when they leave,” the head of the M&R consultancy, Raúl Obregon, told IPS. In his view, there are several reasons why Ortega is one of the exceptions to the rule. In the first place, he said, Ortega’s prospects are enhanced by the fading of popular fears that the FSLN would cause another war if they were returned to power, a fear much played upon by the opposition in the 1990, 1996 and 2001 election campaigns. Secondly, he said, Ortega has followed sound macroeconomic policies and this is recognised by both domestic and international organisations. The rolling out of social projects for poverty reduction has benefited the most vulnerable members of society. Rightwing parties governed the country between 1990 and 2007, but they have now been torn apart owing to internal conflicts, and they have lost influence among the electorate. “They are out of touch with the problems and needs of the people. They talk politics while the population wants to hear proposals to solve their main problems, namely unemployment and lack of access to basic necessities,” Obregón emphasised. Thirty-eight percent of Nicaragua’s 6.2 million people live in poverty, according to international organisations. The 2012 electoral register identifies 4.5 million registered voters. Despite the picture painted by the polls, opposition politicians accuse Ortega of manipulating the laws and institutions in his favour to ensure the outcome of the election and secure his continued grasp on power. Opposition sectors claim the results of municipal elections in 2008 and of the 2011 general elections were fraudulent. Observers from the U.S. Carter Center and from the European Union observers/ said they lacked transparency. This year a number of civil society organisations and other institutions, including the private sector and the Roman Catholic Church, have asked Ortega for greater political openness and for international observers to monitor the elections to guarantee fair play. After that came the move against the PLI leadership, followed in June by the engineering of the disqualification of the candidate nominated by the CND coalition, an umbrella group for the main opposition forces. These events rang alarm bells at international organisations as well as for the secretary general of the Organisation of American States (OAS), Luis Almagro, a native of Uruguay. Humberto Meza, who holds a doctorate in social sciences, said that Ortega’s stratagems to perpetuate himself in power “will drastically affect the legitimacy of the elections,” no matter how high his popularity rating. The Supreme Court “is condemning a vast number of voters to non participation in the electoral process,” he told IPS. “Nicaragua is polarised. Many people are critical of but remain silence for fear of official reprisals,” he said. Democratic institutions are fragile now to an extent not seen since 1990, Meza said. Meza said the concern expressed by the OAS secretary general and any pressure exerted by the international community, led by the United States, were unlikely to have “much impact” on Nicaragua’s domestic crisis.